“Keeping It Ghastly” is a bi weekly article on Japanese horror comics which have English print editions. Some are from famous authors, others are from unknowns and underground artist circles. 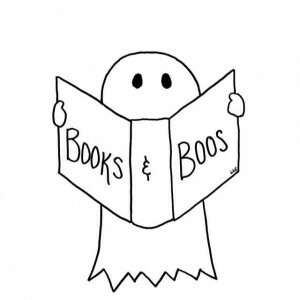 Either way, it’s going to be to a terrifying/awesome ride to keep horror manga on our bookshelves! 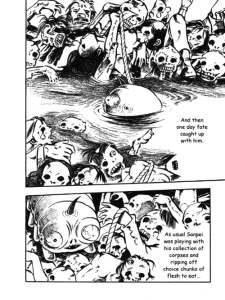 From an initial reading there isn’t anything particularly outstanding about Hino Horror Vol 2: The Bug Boy. The artwork is chunky and the dialogue is dated. Hideshi Hino’s story of a miserable little boy transformed into a insectoid monster doesn’t stand up too well on its own, but in combination with a knowledge of the creator’s past it takes on another life entirely. 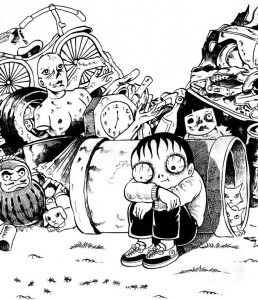 Hideshi Hino’s family life was plagued with uncertainty, fear and anxiety. Having been born in Manchuria, China circa 1946 to Japanese immigrants Hino’s family and neighbors had to hastily evacuate back to Japan to avoid being lynched following the end of WWII. It has been claimed that he was almost killed on this trip by one of the other people who was fleeing the area along with his parents.1 With a grandfather who was Yakuza, a father eking out a living as a pig farmer, and a childhood home surrounded by factories it’s not surprising that Hino drew from the decay and pain around him. His work even borders on biographical such as in Panorama of Hell and Lullabies from Hell in which Hino has written himself in as a deranged artist and narrator. 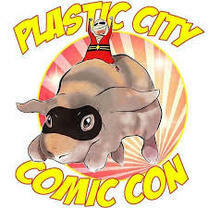 Numerous titles of his also feature a man with a large spiderweb tattoo on his back; a not so subtle nod to his father who also sported this design. Perhaps most famously to Western audiences will be his credits to the Guinea Pig series in which he wrote Guinea Pig: Flower of Flesh and Blood (1985) and wrote, directed and starred in Guinea Pig: Mermaid in a Manhole (1988). (Spoilers) As a character study Bug Boy is a decent attempt to tell the life of a painfully awkward little boy named Sanpei Hinomoto who has a hideous transformation thrust upon him. He manages to make the best of it before realizing his potential to become a monster, whereupon he becomes the one inflicting pain rather than being the victim running from pain. In the end he finds his humanity, but not before becoming mortally wounded. As he is dying he falls into a river and is swept out into the sea, finally at peace. This arc is not unlike that of the monster in Frankenstein in that they are both protagonists who lead painful existences, cause pain unto others, but eventually understand a greater purpose for living. In the case of the monster he realizes his very being is against the purpose of life, while Sanpei concludes that his time as a human, despite the abuse of his family, didn’t warrant his transformation into a man-eater. In short, the whole of humanity shouldn’t suffer his wrath. Although the moral of Bug Boy is heavy, Hino’s comic is clearly aimed at a younger audience. Bug Boy is a written in a storyteller fashion rather than letting the emotions and actions of the characters be conveyed through the artwork. This constant stream of dialogue will turn away most modern audiences who are more accustomed to the slow build of little to no dialogue coupled with highly charged expressive artwork. Hino has a narrator tell the audience what the characters are feeling, how their actions are shaping the world around them, how their dispositions are morphing, everything is explained with almost nothing left for the reader to piece out themselves. That being said it’s not often that horror for younger audiences makes it overseas, so whether you’re a Hideshi Hino fan or are looking for a horror story for a mature 13 year old I would recommend Hino Horror Vol 2: The Bug Boy. The publisher Cocoro Books is no longer around, but it’s easy enough to find copies of this and the other Hino Horror volumes on Amazon or eBay.